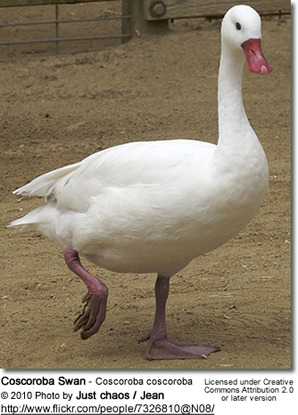 The Coscoroba Swan (Coscoroba coscoroba) is the smallest species of swan. It occurs naturally in South America, where it inhabits well-vegetated swamps and lagoons. It has no recognized subspecies (monotypic). Its name was derived from its calls that sound like “cos-cor-o-ba”. The females are commonly referred to as "pens" (females), the males " cobs," and swan chicks are known as "cygnets." A Swan, Goose or Duck? 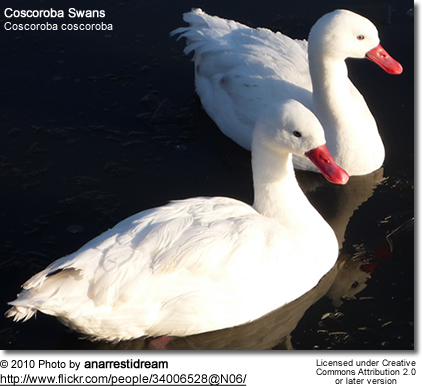 Some scientists consider the Coscoroba Swan to be an intermediate (genetic link) between swans and true geese, between swans and whistling ducks, or potentially both! Some base their theory that the Corscoroba Swan is most closely related to the whistling duck (Dendrocygnini) partially on the fact that Coscoroba Swan chicks (cygnets) resemble young whistling ducks. The Coscoroba Swan's body looks like that of a swan, but the shape of the head more resembles that of a goose. The Coscoroba Swan lacks the characteristic basal knob (above the upper bill) found on most other species of swans. Unlike other swans which have bare skin extending from the bill to the eye, those areas are covered by feathers in the Coscoroba Swan. 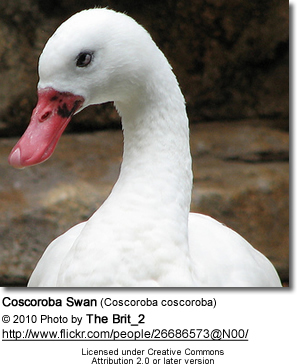 The Coscoroba Swan lacks the black face mask of the other swans (between the eyes and beak, known as "lores"). The Coscoroba Swan's wings are shorter and wider (in proportion) than those of other swans. 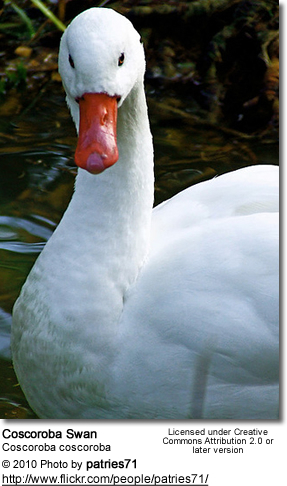 Compared to other swans, the Coscoroba Swan has a much smaller body, shorter neck, and longer legs. Its bill is also smaller in size, more resembling that of a duck. 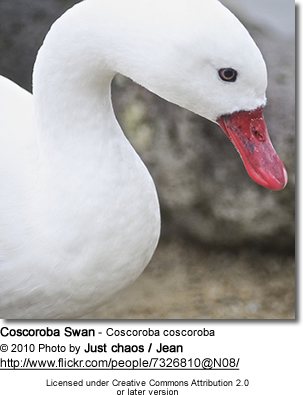 The Coscoroba Swans' calls resemble those of geese. Unlike other "typical" swans, the Coscoroba Swans do not carry their cygnets on their backs. Typical swans perform what is commonly referred to as "triumph ceremony" referencing the male's performance after successfully challenging a rival suitor. This ceremony involves posturing and calling. This behavior that is typical in swans has not been observed in Coscoroba Swans. The Coscoroba Swans occur naturally in the southern parts of South America, where they are found from the extreme southern South America (islands in the Beagle Channel), Tierra del Fuego (located at the southern tip of South America) north though the Chiloé Province in the southern Chilean region of Los Lagos to central Chile (Santiago) and northern Argentina. Its global population is estimated to consist of about 100,000 individuals. 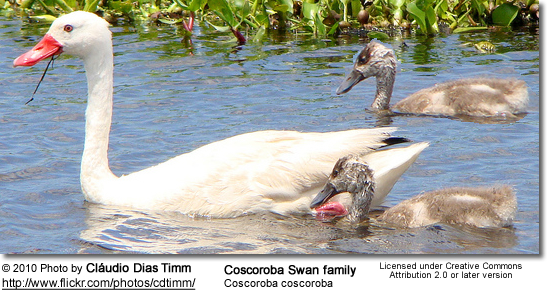 The Coscoroba Swan breeds in South America from southern Chile and central Argentina south to Tierra del Fuego. In recent years, its numbers have increased on the Falkland Islands - also known as Malvinas Islands - situated about 300 miles or 480km north-east of the southern tip of South America - where breeding pairs with young have been photographed in 2009. Most breeding activities have been observed in southern Argentina and southern Chile. The southern populations migrate north to spend the winter in central Chile, northern Argentina, Paraguay, Uruguay and southern Brazil (in Rio Grande do Sul). Some have moved as far north as central Brazil. Those occurring in the central part of their range (including northern Uruguay, central Chile) are mostly sedentary (non-migratory); and in those areas, pairs seem to maintain a territory which they defend throughout the year. The Coscoroba Swan frequents wet areas, such as ponds, lakes, canals, swamps, lagoons and freshwater marshes with vegetated shores for cover. During the nights, they usually roost on the water or on isolated islets near the shore. Coscoroba swans are usually found at low elevations; however, they have been documented to occur at altitudes of up to 3,300 feet (1000 meters) or even higher. During the summer (breeding) season, they usually occur in pairs or family groups. During the winter (non-breeding season), these sociable birds are usually seen in flocks together with their own species and other waterfowl - in numbers that may range from a few dozen up to several hundreds of individuals. During migration, Coscoroba Swans often intermingle with Flamingos or Black-necked Swans. They have been recorded to travel at extreme elevations of about 26,277 feet (8,000 m). It is assumed that these high altitudes allow them to take advantage of stronger air currents. Like other migratory birds, they also fly in an aerodynamic V-formation to preserve energy, as the bird in the front reduces the air resistance for the bird behind it allowing them to cover longer distances. Members take their turn at the point of the V.
At this point in time, the Coscoroba Swans are locally common and widespread. However, they are threatened in parts of their range. The Coscoroba Swan is the smallest swan species; it is slightly smaller than the Black-necked Swan (Cygnus melanocoryphus). Adult females and males look alike - although the female may have darker eyes. For the most part, males and females can only be differentiated by size. Males are generally longer, heavier and have a wider wingspan. The average body length for males and females is 3 - 4 feet (~88 – 115 cm). The flattened bill measures between 2.5 - 2.7 inches (6.3 - 6.8 cm). The lamellae (miniature ridges inside the bills of water-feeding birds or "teeth") function to filter food. As these swans scoop up food and water, they squeeze out the water through the lamellae. Inside the upper bill is a hard, horny tip (the "nail") that breaks up open mollusks. Males have a wingspan of 18.9 inches (48 cm); females have a wingspan of 17 – 18 inches (43 – 46 cm). Males weigh between 8.4 - 11.9 lbs (3.8 - 5.4 kg) and females between 7 - 10 lbs (3.2 - 4.5 kg). The average weight is 10 lbs (4.6 kg). The plumage is all white except for the black wing tips that are visible in flight. There may also be some black feathers at the end of the tail. 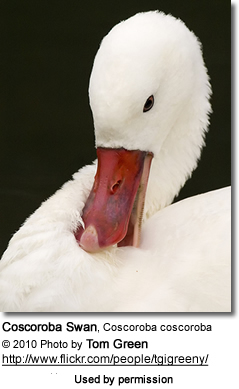 Occasionally, the necks and faces of Coscoroba Swans become stained from the mud or other minerals in the water. The beak, legs and webbed feet are reddish, bright pink or orange in color. The eye color greatly varies from yellowish, orange, reddish to brown. Unlike other swans that have bare patches of facial skin between the eyes and the bill, those areas are covered with feathers in the Coscoroba Swan. Their pointed wings are relatively short and strong, with well-developed wing muscles. The plumage of the cygnet is usually duller than that of the adult, with a patchy coloration consisting of whitish feathers and grey-brown blotches on the head, back and wings. Juveniles have blue-grey or red-grey legs and bills with a white “nail” (a hard, horny tip inside the upper bill). The eyes are dark brown. Juveniles reach sexual maturity at about three years. Most breeding occurs during the southern (Austral) spring and summer, between October and December. 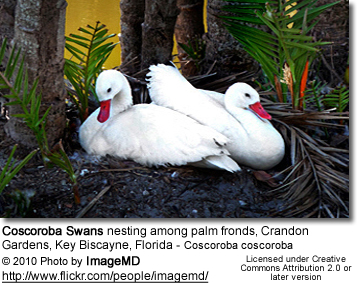 Like other swans, Coscoroba Swans usually mate with the same partner for life. In cases where a Coscoroba Swan loses its mate, he or she usually takes a new mate. Rarely separations occur - often following nesting failure. During the breeding season, the males perform courtship displays to attract females. During the actual mating, the male bites the female's neck while making loud calls. Mating mostly takes place in water. Coscoroba Swans usually nest alone or in well spread out, small colonies, with each pair defending an area or territory around their nest site. They are choosing nest sites with easy access to water or direct access from the air. The nest is usually located close to water, on small islands, in reed beds, or partially floating on the edge of a waterway in tall grasses. The male is responsible for building the bulky nest using large amounts of grass and aquatic plants. The nest is typically shaped in a conical mound with a shallow depression on top, which the female lines with down, feathers and soft grasses. At one day intervals, the female lays 3 - 7 creamy-white eggs, sometimes even as many as 9; and she alone incubates these eggs for 28 to 35 days. Sometimes incubation can last up to 40 days under less than ideal conditions. Each egg weighs between 4.5 - 7.2 oz (129 to 203 grams) and measures 3.2 – 3.7 inches (8.2 – 9.4 cm) in length and 2.1 – 2.6 inches (5.3 – 6.7 cm) in width. Since the male doesn't feed the nesting female, she usually gets off the nest twice a day to eat. Before leaving, she will cover the eggs with plant material both to prevent the eggs from getting chilled and also to hide them from predators. During the incubation period, the male remains close to the nest and aggressively defends the area around the nest against predators and intruders. When nesting, the female will vigorously defend the nest-site - if necessary with direct attacks on intruders. The young usually hatch at about the same time. The chicks can be heard from inside the eggs a few days before hatching. The hatchlings weigh about 3.5 – 4.2 ounces (99 – 119 g) and are covered with mostly silver-grey or brown down, except the black coloring on the head and the three darker grey stripes on the back. Its bill is grey, edged with pink. The legs are pale pink tinged with grey. They look similar to the young of Whistling Ducks. The chicks' eyes are open and they are able to swim and find food within a few hours of hatching. Their down is fully waterproofed, enabling them to freely dive for food. The day after hatching, they weigh between 3.5 - 4.2 oz (99 to 119 grams), with an average weight of 3.9 oz (110 grams). Unlike other birds that feed their chicks regurgitated food, Coscoroba Swans lead their chicks to suitable feeding areas. The parents use their feet to stir up aquatic matter from the bottom to the surface for the chicks to feed on. The young mostly eat small invertebrates and small crustaceans for the first few weeks. The cygnets may fledge (take their first flight) as soon as 60 – 75 days after hatching, however, most will do so when they are about 3 – 4 months old. Both the male and female help in raising the young and protect them from predators. The young cygnets usually remain near their mother; however, may move away in the search of food. The chicks are initially flightless and are easy prey for small mammals, birds of prey and gulls. When spotting danger, the female makes short, high-pitched alarm calls following which the cygnets seek cover amongst shoreline vegetation, where they will wait quietly, until the mother resumes her normal contact calls. Even though the parents aggressively defend their chicks, mortality is still high and about 80% of the chicks don't survive the first 12 months of life. If one clutch gets destroyed or if a pair nests early in the season, it is possible that a second clutch could be raised before the yearly molt, which takes place at the end of the breeding season. After completion of the breeding season (usually in fall, sometimes earlier at the southern end of their range), the adult swans usually move over to some lakes where they go through their yearly molt. During this time, they lose all their flight feathers at once, rendering them flightless for about 3 - 4 weeks, until the new feathers grow in. During the flightless time, Coscoroba Swans typically gather in large flocks for protection. The young remain with their parents throughout the winter; and afterwards migrate with them to the breeding grounds. Non-migratory swans usually reject their previous-year young when they are preparing for the next brood. Cygnets reach adult size when they are about 8 months old, but they usually don't commence breeding until they are at least 3 years old. Some males in particular don't start breeding until they are 5 years old. Coscoroba Swans mostly feed on grass and other plant matter, including leaves, buds, stems, seeds, roots and tubers; aquatic plants; small aquatic invertebrates (mollusks, mussels, small crustaceans and insects) and small fish. They feed in shallow water by dabbling or grazing on the surface of the water for plants and algae. They insert the head, neck and part of the body underwater to pull out aquatic plants and catch small prey under water. They also graze on young plants growing along the shoreline or in pastures. When feeding in water, they will hold whatever they are feeding on in their beaks, and squirt the water out through the lamellae (miniature ridges inside the bills serving as filters during feeding) found on each side of the bill. Captive Coscoroba Swans are often fed romaine lettuce and waterfowl pellets. Captive Coscoroba Swans can expect to live about 20 years - with a maximum recorded lifespan of 36 years. In the wild, they usually only live to 7 years due to predation and accidents. 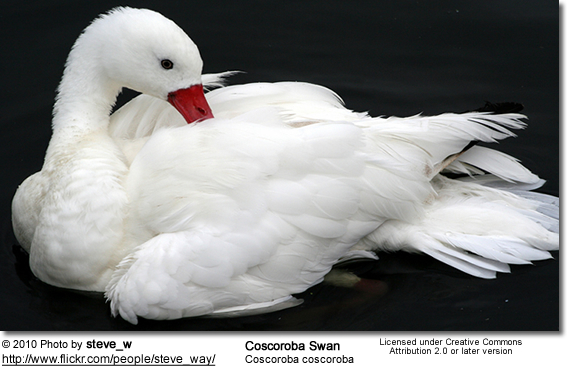 The Coscoroba Swan was named for the loud, trumped-like "cos-cor-ooo" call with longer and higher-pitched first syllable. Females' vocalizations are higher pitch than males'. When caring for their young, both males and females make lower-pitched calls.